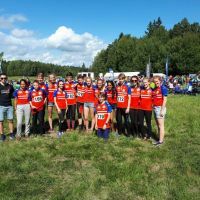 In May of this year, I was fortunate enough to be selected to attend a National Junior Elite training camp held in Stockholm in Sweden, along with 17 other M/W 16s and 17s. I’d competed in all but one of the major selection races during the season and had had some good results overall. 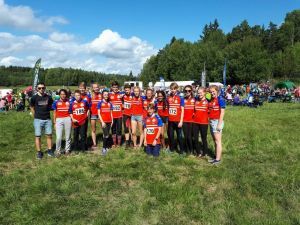 The camp ran from the 8th – 20th August. I arrived on the Tuesday afternoon and got to know the other runners, who were from squads across Great Britain and we all spent the rest of the day settling into our accommodation, the OK Ravinen club hut, and going for a light jog around a very pretty lake in Hellasgården where we would often swim over the next fortnight. The first day’s proper training threw us in at the deep end, with some of the most detailed contours I’ve ever experienced. Luckily the legs weren’t too long so I only got lost a couple of times! We then went on to do a 3km time trial followed by an urban hash in Stockholm. Despite being one of the few who had done a hash before, in my case with the Otter Valley Hash group, I took a wrong turn at the start and ended up following the trail backwards to meet up with everyone else again! Over the next few days we followed the same routine of leaving the hut at around 9am to train, before having lunch and completing further training. We’d then go for a swim or return to the hut to go through the day’s courses. Each day had a different focus, including a very difficult corridor course, which made us think about running in straight lines and focusing on only a few details. I managed to get lost for about half an hour on the way to Number 1 on this exercise! The terrain in Sweden was completely different from that in the South West, with perfectly runnable forests interspersed with crags and boulders; if you weren’t careful, you often found yourself looking over a steep drop before having to detour around it! The closeness of contours also meant that you had to stay in contact with the map for a lot of the time. It was a good way to end an incredible tour, during which I learnt a great deal and had lots of fun and I now want to put into practice some of the techniques I picked up while in Sweden in the UK. I would definitely recommend trying for selection to upcoming Devon juniors as it is an experience you’ll never forget. I’d like to say a big thank you to Nick Barrable for organising the tour and to all the other coaches for making my time in Sweden so amazing. 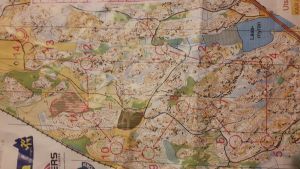 I’d also like to thank Devon Orienteering and the South West Orienteering Association for giving me grants so that I could go on the tour.